– I am a retired programmer/analyst and the Bee Farm Director at TFA. I hold an A.A.S. Degree in Computer Science and Programming from Florida Community College at Jacksonville, FL. 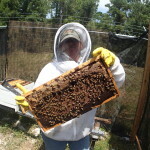 I spend my days farming and playing with Honeybees. I love helping children and adults learn about beekeeping/farming, for those who learn farming will never be without. I am from Mandarin, FL.